Hell (understood as eternal torment) has been widely soon as Christianity’s most damnable doctrine by many atheists and skeptics. Very few people, however, ask themselves if that teaching can truly be found within the page of the Bible. In what follows I interviewed Chris Date, a prominent proponent of the view of conditional immortality about this hot (if not burning) topic. Lotharson: Hello Chris, thank you very much for having accepted my invitation. Could you, for the benefit of my readers, sum up your personal and religious background? Chris Date: Sure. I was raised without any influence to believe in God (that I recall), although I found out later in life that my parents both believe in Jesus Christ. While very young, I expressed fleeting interest in the Jehovah’s Witnesses and Mormonism, because family members and friends were among those groups. I also had some brief interest in Wicca as a teenager. Otherwise, however, I was an atheist into adulthood, and mocked Christians and Christianity. My now wife and I got married as atheists when I was 20, which was 14 years ago, and around 2 years later I became a believer in Jesus and quickly became interested in theology and apologetics. My wife was born again a few years later. I’ve been a software engineer at a prestigious Northwest software company for the past 12 years or so, though one day I hope to move into full-time ministry, or to become a University professor of Bible and theology. I should say I also have four sons, ages 12, 8, 4, and 5 mos. Let us focus now on the topic of that interview. What are (in a nutshell) the traditional doctrine of eternal conscious torment and annihilationism/conditional immortality? The traditional doctrine of hell, or final judgment, or personal eschatology–however you want to put it–holds that the day is coming when all the dead will rise bodily from the graves, and those who have saving trust in Jesus Christ will spend eternity in the blissful presence of the Lord with the saints. Those who deny Jesus Christ, however, will be judged and punished according to their sins, which will entail an eternity of spiritual, psychological, and/or physical torment separated from God and his people. It’s important to emphasize that this is not a disembodied eternal state. The formerly dead bodies of the lost will have arisen, blood once again pumping, lungs once again expanding and collapsing, muscles once again flexing, etc. And it is in this immortalized body, incapable of dying, in which the lost will suffer for eternity somewhere in the physical universe. Annihilationism, on the other hand, more historically known as conditional immortality, is the view that immortality and everlasting life are not intrinsic to our nature, and that it is instead a gift which God gives only to those who have a saving relationship with Jesus Christ. Yes, we believe the lost will rise from the dead with the saved, but those who have not united themselves with the source of life will not live forever, but will instead die a second, permanent death–annihilation. Traditional “dualist” Christian annihilationists or conditionalists, who believe humans are comprised of an immaterial soul united with a physical body, would say that in the first death only the body dies, but that in the second death both body and soul will die (Matt. 10:28). Many other conditionalists are “monists” or “physicalists” who believe man is a physical creature who does not live in any sense while dead, and that their hope in an afterlife is found only in the resurrection. Either view–dualism or physicalism–is compatible with the biblical teaching that eternal life is a gift given only to the saved and that the risen lost will die a second death. 1) I think that a sound interpretation of the Bible should first seek to understand the oldest texts in order to interpret the most recent ones. Critical scholars believe that many writers of the OT did not believe in an afterlife. The dead do not praise Yahweh, nor do any that go down into silence. But we will bless Yahweh from this time on and forevermore. Praise Yahweh! Turn, O Yahweh, save my life; deliver me for the sake of your covenant faithfulness. I personally find these passages extremely compelling. How are those texts interpreted by Evangelical traditionalists and conditionalists? Traditionalists would say that either those passages reflect a yet underdeveloped understanding on the part of the biblical authors, and that via progressive revelation the Lord revealed more about the afterlife in the New Testament, or they would say that they are talking mostly about goings on in this world, of which the dead will not have a part, without excluding conscious activity in another realm. Some conditionalists would say the same thing, particularly the dualist conditionalists I mentioned in answering your previous question. Other conditionalists, however, the physicalists or monists I mentioned, would say that these texts indicate that man is not conscious in death, that death is like a “sleep” in which one is unconscious. However, there are hints of an afterlife to be found in the Old Testament, hints pointing toward resurrection and eternal life. Definitely, though, whatever understanding and expectation they had of a future life was underdeveloped, and the New Testament provided more detail. 2) If eternal torment is far worse than a violent death, then why did not God clearly warn the Isrealites during the overwhelming majority of the OT time? Would it not be loveless and irresponsible to give them the impression that the wage of sin is “only” destruction? Boy, I’m trying to put myself in the shoes of a traditionalist, and it’s tough. I’m not sure how one might answer that question. I suppose a traditionalist might say that the ancient readers of the OT understood “death” and “destruction” differently than we do, that they viewed it as some form of conscious separation, from one’s body or from one’s God, and so therefore they wouldn’t have necessarily ruled out the traditional view of hell. Traditionalists might further say that there are hints of the traditional view of hell to be found in the OT, such as in Daniel 12:2 and Isaiah 66:24 (neither of which supports their view, as perhaps we’ll see in a bit). And so in the interest of charity, I’m not prepared to concede that God would have been unloving and irresponsible in not fully revealing the traditional view of hell (if it’s true) in the OT; he may have done so more clearly than we moderns think. That said, it does seem clear to me that throughout the OT, the punishment for sin was seen as death, being cut off from one’s people and from life on earth. And eschatological punishment was seen in the same way, such as in the aforementioned passage in Isaiah in which God’s people are vindicated in the valley of Gehinnom when God slays his enemies and leaves their corpses to rot and smolder in fire. I would not say that the absence of the traditional view in the OT would make God unloving and irresponsible if it’s true, but I would say the fact that there is such an utter dearth of evidence for it in the OT, and an overabundance of evidence for conditionalism in it, that therefore my view is heavily favored. 3) Quite a few passages in the Old Testament speak of an unquenchable fire consuming the wicked and of worms eating them. Likewise we find several references to the “gnashing of teeth” within the OT. Many centuries later, Jesus used a similar language for describing the fate of the wicked. a) Jesus saying can only be interpreted as meaning that the damned will be literally eternally tormented. Conservative Jews of His time only interpreted these passages in this way. Did I correctly characterize their position? If so, does it hold water? Chris Date: Well many traditionalists simply aren’t familiar with several of those OT references you mentioned. Their claim is that Isaiah 66:24’s unquenchable fire means a fire which will never die out, burning forever and ever, never consuming its fuel, and that its undying worm is a maggot which will forever have food to eat, never consuming its host. That host, in the minds of most lay traditionalists, is the living bodies of the lost in eternal torment in hell. Traditionalists more familiar with the debate recognize that that passage explicitly identifies the maggot’s host and the fire’s fuel as corpses, but as you suggest, they would say nevertheless that the unquenchable fire and undying worm can only be understood as promising everlasting torment in risen bodies in hell, by means of metaphor or analogy (since what Isaiah refers to are corpses, not living bodies). However, as you have noted, there are many passages in the OT in which unquenchable fire is used, and in the vast majority of them–certainly all the ones which are relevant to this question, since they involve the fiery wrath of God–unquenchable fire is not a fire which will burn forever, never dying out. Rather, it’s a fire which is irresistible, inextinguishable. It is unstoppable. What would happen if you arrived home from work to find fire fighters trying desperately to put out a fire, and one of the fire fighters told you they are not going to be able to quench the fire? Well, obviously, it would burn up the house. That’s what this idiom of unquenchable fire means throughout Old and New Testaments. The same is true of the undying worm. It’s an unstoppable scavenger, much like two other places which I can’t recall off the top of my head, in which Israel is told that her corpses will be food for the birds of the sky and the beasts of the earth and that no one will frighten them away. The fact that the scavengers can’t be frighted away does not mean that they will forever have food to eat, but that they won’t be stopped from fully devouring their food–the corpses. Likewise, the undying worm is a maggot which won’t be prevented by death from fully consuming its food–corpses. As for the other passages you mentioned, many traditionalists seem to have this strange idea that I quite frankly can’t relate to, that the mere presence of texts which speak of some sort of conscious experience in judgment rules out any possibility of annihilation. And yet, violent death is immediately preceded by sorrow and anger, and its infliction entails pain and agony. Nowhere does the Bible indicate that these experiences will last forever. Finally, yes, traditionalists tend to think that Jews of Jesus’ time all believed in eternal torment, and interpreted OT passages as saying so. Yet, this belief is based on old, outdated research based on limited access to ancient Jewish literature. Modern research, with its access to numerous Dead Sea Scrolls, has revealed that ancient Jews of the afterlife were mixed, that many of them believed in annihilation, and that none of Jesus’ language would have been universally understood by his audience as referring to eternal torment. 4) A current argument for endless torment looks as follows. b) this pain will last eternally in the same way the bliss of the chosen ones will be forever. What problems do you see with this? Well the problems are twofold. First and most importantly, the parable isn’t even set in hell. It’s set in Hades, the underworld, the place of the dead. The rich man’s brothers are still alive, and he, dead in Hades, pleads that someone would go and tell his still-living brothers to repent. None of this would be possible in the eschaton. Besides, the text explicitly states he’s in Hades. And we know that one day mankind will be raised up out of Hades, given once again living bodies, at which point they will be finally judged. So there’s simply no good argument to be made for the traditional view from this parable. Secondly, there’s little reason to believe Jesus intends for the parable to be taken as a realistic description of the afterlife in the first place. Scholars of ancient Jewish literature have found several very similar stories that are sort of life fairy tales, or folk tales, not intended to be taken literally, but communicating a moral point. And Jesus appears to take these and turn them on their head, sort of telling his hearers that they’ve got things all wrong when it comes to the rich and the poor. Imagine, if you will, if Jesus were to come to us today and tell a story very similar to Humpty Dumpty, but whereas the king’s men in the original could not put Humpty back together again, in Jesus’ version the king himself puts Humpty back together again, as an illustration that God will one day raise his people from the dead. No one would think that Jesus was saying the afterlife would literally be like what happens in Humpty Dumpty. We’d all recognize that he was co-opting a common fairy tale of our day in order to communicate spiritual realities, like he does in all his parables. So I don’t see any reason to take the parable literally. But let me reiterate that that’s only secondary. Even if one is inclined to take Jesus’ parable as a generally realistic account of the afterlife, the most it could lead one to do is embrace dualism and a conscious intermediate state awaiting resurrection. Again: The parable takes place in Hades, not hell. And what about the paralell between eternal bliss and damnation? Chris Date: Oh, sorry. Yeah, Matthew 25:46 says only that the punishment will be eternal. It doesn’t say what the nature of that punishment will be. Conditionalists affirm that the punishment of the damned will be as eternal in duration as the bliss of the saved. Where we disagree with traditioanlists is when it comes to the *nature* of that eternal punishment. Traditionalists see it as an eternity of conscious suffering of some sort; conditionalists, on the other hand, recognizing that the Bible says the wages of sin is death, believe that the punishment awaiting sinners is death, and that when they die the second death at the final judgment, they will be dead forever. It is, therefore, an eternal punishment. Now, traditionalists will tend to push back and say that “eternal punishment” necessarily entail some sort of everlasting process of punishing (even though the text provides no such indication). At this point, I point them to places in the book of Hebrews in which the author speaks of the “eternal salvation” and “eternal redemption” purchased for us by Jesus Christ. Jesus is not and will not be forever undergoing the process of saving and redeeming; he accomplished that once and for all by his life, death, and resurrection. Rather, “salvation” and “redemption” in these passages are nouns that refer to the outcome of the verbs “save” and “redeem,” respectively. “Eternal salvation” and “eternal redemption” thus speak of the eternity in duration of the results of a saving and redeeming process. Likewise, “eternal punishment” speaks of the eternity in duration of the results of a punitive process. The process is execution; the outcome is death. “28 And fear not them that kill the body, but are not able to kill the soul; but rather fear Him that is able to destroy both soul and body in hell. There are two traditionalist strategies for dealing with it. a) “Kill” is actually a mistranslation of the greek word which could also means “ruined” or “lost”. According to your own experience, do most traditionalist argue that one should not fear those who can “ruin the body”? Or do they accept that it means “kill” in this part of the sentence while meaning the ruin or desolation of “body and soul” in the second part? Well actually, it’s not “kill” in the first clause that traditionalists question. It’s “destroy” in the second. Oh wait, that’s what you said 🙂 Yes, you’re right. They think that the Greek word translated “destroy,” which is apollymi, means something like “ruin” or “desolate,” and they’ll point to some places where food spoils (apollymi), or oil is wasted (apollymi), or a sheep is lost (apollymi). However, as Dr. Glenn Peoples explains in an article at Rethinking Hell (http://www.rethinkinghell.com/2012/10/the-meaning-of-apollumi-in-the-synoptic-gospels ), the word is used in a particular way by Jesus in Matthew 10:28, and in every other relevant occurrence in the synoptic gospels when the word is used in this way, it means something like slay or kill. And of course, context determines which meaning in a word’s semantic domain is the intended one, and in Matthew 10:28 Jesus is contrasting those who can’t do something–kill the soul–with those who can. So we have every reason to understand “destroy” in the second clause as meaning something like “slay” or “kill,” and the traditionalist “ruin” explanation just doesn’t hold muster. b) the second strategy consists of recognizing that “destroying” is the right meaning, but that it is a threat that God is never going to actually carry out, it just describes His ability to do so. What’s your take on this view? Chris Date: I think it’s silly. I’ll say the same thing Glenn Peoples said when he addressed this response in episode 4 of our podcast (http://www.rethinkinghell.com/2012/09/episode-4-the-case-for-annihilationism-with-glenn-peoples): Jesus might as well have said, “fear the one who can turn you into a chicken.” Of course, the threat doesn’t carry any weight if it’s not something he might, in fact, do. What’s more, the disciples whom Jesus was warning faced the real danger that people might kill their bodies. So I think we have good reason to believe that there are those who face the real danger of being destroyed in body and soul. And of course, this conditionalist understanding of Matthew 10:28 is consistent with myriad and varied passages elsewhere in Scripture which promise the same fate for the lost. 6) the apocalyptic imagery of John speaks of eternal torment in a very vivid manner. Is that not a clear proof that at least the exiled apostle thought of hell as endless pain? Chris Date: Quite the opposite. Revelation is, as you say, a genre of apocalyptic imagery. Its interpretation requires careful exegesis. The picture of smoke rising forever comes straight out fo the Old Testament. In Isaiah 34:10 smoke rises forever from the remains of Edom, which in the prophetic picture is destroyed; Abraham saw smoke rising from the remains of Sodom and Gomorrah, which had been destroyed. This picture, of smoke rising forever, is kind of like today’s mushroom cloud. When one sees smoke rising forever in a mushroom cloud, one doesn’t think of everlasting flames, but of utter destruction. That is what this image communicated in John’s vision. You can see this where it’s employed elsewhere in John’s vision. The harlot, Mystery Babylon, is said to be tormented in flames in the vision (Rev 18), and the great multitude in heaven cries, “Hallelujah! The smoke from her goes up forever and ever” (Rev 19:3). Yet, when interpreting this vivid, perplexing imagery, the angel takes a great millstone and throws it into the sea, explaining that all of this imagery communicates that the city represented by the harlot will be destroyed, and will not be found any longer (Rev 18:21ff). What’s more, the imagery of drinking God’s wrath is imagery communicating slaughter (Job 21:20-21; Jer 25:15-33). And the imagery of sulfur and fire comes from those passages I already mentioned–Gen 19:24-28; Isa 34:9-10–in which cities are destroyed. ALL of the imagery in this passage would have communicated to its first century readers the idea of utter death and destruction. 7) If the traditional view is true, Christ was just ready to suffer a violent and painful death (limited in time) in order to save people from eternal torment. Yet the apostle Paul would have been ready to eternally suffer for the sake of the salvation of his fellow Jews. for the sake of my brethren, my kinsmen according to the flesh. Since traditionalists argue that eternal torment is far worse than a violent execution, should we conclude (given the truth of their assumptions) that the Apostle Paul was infinitely more noble and heroic than the Son of God Himself? Chris Date: To be fair to traditionalists, no, I don’t think we should. Jesus, by virtue of being the Godman, divine and human, was of infinitely greater value than Paul, and a traditionalist could say that Jesus’ death was of infinite value and therefore he didn’t need to suffer eternally, and nor was his sacrifice any less profound than the one Paul was willing to make. However, it’s important to recognize that over and over again the Scriptures indicate that as our substitute (whether one thinks of him as a penal substitute like I do, or as some other form of substitute as many critics of penal substitution do; either way, the atonement was substitutionary) what Jesus did in our place, in our stead, was die. He died, in our place, so that we won’t have to. And he didn’t die in some vague, esoteric, metaphorical sense; no! He physically died, was rendered a corpse. How different from the traditional view of hell in which the risen lost are punished by suffering pain in immortalized bodies that live forever! In conditionalism, on the other hand, Jesus suffered the death penalty in our place so that we can be given life that lasts forever, and those for whom he didn’t die (in a Calvinist view like mine), or those to whom the merits of his sacrificial death are not given (in a non-Calvinist view), must therefore suffer death. One last thought on this point. I think the danger of traditionalism is not that it risks making Paul more sacrificial than Jesus. Rather, I think it risks coming dangerously close to heresy when it comes to the atonement. You see, when traditioanlists are asked why Jesus didn’t suffer forever on the cross, they’ll typically say that the few hours of suffering he experienced is equivalent in some way to the eternity of suffering awaiting the risen lost. But consider what that does! If the eternity of punishing awaiting the lost was entirely paid for in the finite duration of Jesus’ suffering, why did he go on to die? His death would have been arbitrary and unnecessary, when it’s what the Scripture emphasizes as the central aspect of Jesus’ atoning work. That’s the problem with traditionalism. 8) Why did the apostles almost never mention hell, let alone eternal torments, if it were of such importance? Chris Date: Good question! Paul speaks of “everlasting destruction” in 2 Thess 1:9, and more generically of wrath and so forth in places. But you’re right, they don’t speak much about final punishment. So I don’t know a traditionalist would answer your question. I would answer the question by saying that the most serious aspect to final punishment is in what is missed out on: eternal life. And so by talking so much about the gift of life, the apostles were implicitly warning of final punishment which entails the everlasting deprivation of life. 9) New traditionalists (such as Phil Fernandez or French theologian Henri Blocher) argue that only the saved ones will inherit eternal life. The damned will EXIST (but not live) and suffer eternally, but be utterly reconciled with God who is obliged to torment them endlessly for justice’s sake. Does this picture of “victory” hold water? Chris Date: Well regarding the first of those two issues, as I explain in an article at Rethinking Hell (http://www.rethinkinghell.com/2013/10/obfuscating-traditionalism-no-eternal-life-in-hell), the Bible explicitly says that resurrection entails bringing a formerly dead back to life, and so by biblical definition, the traditional view of hell entails the lost inheriting eternal life. There’s simply no escaping that. It may not be the same “eternal life” spoken of in the NT, but it is a form of eternal life, and I think honest traditionalists need to own up to that without trying to dodge it. The risen lost, in their view, will NOT merely exist forever, they will live forever in bodies which never die again. As for the lost being reconciled with God, that’s something a few modern “reconciliationists” believe, and I’m frankly not familiar enough with the nuances of their view to say much about it other than that their reconciliation with God does not entail their being united with him and his people forever. In other words, they remain lost, and eternally. Of course, this view fails for the same reason all other variations of the traditional view fail: the Bible says everlasting life will be given only to the saved, and that the risen lost will instead die, perish, be destroyed. As for the biblical picture of God’s victory, and which view of hell is most compatible with it, I’d encourage your readers to listen to episode 4, to which I already linked above. In it, Glenn Peoples explains why the biblical picture of eternity is most compatible with conditionalism. He also lays out the case briefly in our upcoming publication, Rethinking Hell: Readings in Evangelical Conditionalism, which we expect to be published by Wipf & Stock this Spring. 10) Can conditional immortality account for degrees of punishment? Chris Date: Yes, and in a variety of ways. One way is by allowing for an infinite number of combinations of type, intensity, and duration of suffering involved in the destructive process. The ultimate punishment they pay is death, but its infliction involves degrees of suffering, accounting for degrees of punishment. Another way is by allowing for degrees of shame. Some may be remembered forever in far greater contempt than others. Either way, degrees of punishment are completely compatible with conditionalism–in fact, more so, I think, than with traditionalism. After all, any difference in degree of torment fades into nothing after a trillion trillion years of it. 11) I deal quite a lot with the New Atheists (anti-theists) on my blog. Their arguments are generally extremely shallow, but they often sound quite convincing due to their use of a very aggressive rhetoric involving a huge amount of emotional bullying. It looks like that many (though not all) traditionalists uphold the strength of their position by resorting to a similar strategy. This seems quite clear to me after I watched a “discussion” between Michael Brown and Edward Fudge and many callers which rang like a true inquisition. Do you think it is a fair assessment of the situation? Chris Date: In some cases, maybe even many, yes. I’ve experienced it; many other conditionalists have as well. But I think this is something we all, as human beings, tend to do. We’re fallen sons and daughters of Adam; we’re prideful and we want to be right. And so we tend to bully others into thinking like us. Traditionalists aren’t the only ones guilty of it; we all have to repent of it in certain areas of our lives, including myself. Our primary goal at Rethinking Hell, and the thing I’m passionate about that drives me to invest time and effort into this topic, is to nurture Christian unity and charity. Too often Christians treat the issue of hell as a topic worth dividing over–and not just dividing over, but worth treating one another with contempt and with disrespect. We want to do what little we can to remedy that, but encouraging frank and honest disagreement, as well as intellectual rigor, but done with brotherly love, respect, and charity. If traditionalists, conditionalists, and even universalists can present a united front to the world, including those New Atheists you mentioned, treating each other with respect and charity when we have our in-house debates over hell and other secondary issues, I think we’ll be far more effective agents for change in the world. That’s entirely true and I also need to constantly keep myself in check for avoiding intellectual pride and self-righteousness. 12) How often do you hear the complain that conditionalists are liberals who reject the “clear teaching of Scripture” on purely emotional grounds? Chris Date: Ha! I can’t count the number of times I’ve heard that. But it’s simply untrue. In my case and some other conditionalists, emotions never played a role. We were convinced solely by exegesis of the text. In fact, my emotions tugged me in the direction of the traditional view I had already held. I desperately wanted to avoid adopting a position that would close ministry doors to me and would cause apologists and theologians I respect and admire to think poorly of me. But my commitment to Scripture forced me, kicking and screaming, to become a conditionalist. Many conditionalists, it is true, first began questioning the traditional view for emotional or philosophical reasons, but they didn’t simply embrace conditionalism on those grounds. They returned to Scripture to see if perhaps they and most other Christians had gotten it wrong. And having done so, they discovered the utter dearth of biblical support for the traditional view, and the overwhelming reams and reams of evidence in support of annihilation. 13) Is there a hope that annihilationism will soon be considered as a respectable Evangelical position in the near future? Chris Date: Yes, I think it’s inevitable. It’s already becoming one. Christian scholars like Basil Atkinson, E. Earle Ellis, Dale Moody, John Stott, John Wenham, Richard Bauckham, David Instone-Brewer, Gordon Isaac, Douglas Jacoby, I. Howard Marshall, Preston Sprinkle, and John Stackhouse (to name just a few) have embraced the view, and as more and more of them continue to do so, traditionalists will be less and less able to treat annihilationism as if it’s a fringe movement held only by liberals, sentimentalists, and cultists. 14) How many percent of conservative Evangelicals hold to conditonalism? Chris Date: Oh I have no idea. We’re a minority in America, but a growing one. Actually, we may not be a minority in conservative Christian academia; John Stackhouse and Edward Fudge have said that many Christian academics have told them that they are persuaded by our view, but can’t say it for fear of losing their jobs. In Britain I think we’re an even larger minority, if not a majority. But again, in terms of numbers, I can’t begin to guess. 15) I want to talk a bit about Calvinism. I am strongly opposed to this doctrine but realize that many of my arguments could lose much of their strength if hell means the cessation of existence. Yet I have not (until now) dealt with reformed condtionalists because I consider their number to be extremely small. Am I justified in that assumption? Chris Date: Yes, I think so. And…Let me just say that while I am Reformed…Many of the Rethinking Hell “staff” are not. Rethinking Hell does not official endorse any view of soteriology over another.But yes, you’re right, there aren’t many of us Reformed conditionalists. 16) To conclude, I want to say that while I reject the teaching of Biblical inerrancy, I really find that your exegesis and that of Dr. Glenn People is very serious, scholarly and intelligent. You represent the very best of Conservative Evangelicalism to my mind. Could you please sum up the most useful ressources my readers interested in the topic could take a look at? Thanks! I appreciate that. I recommend your readers purchase either Edward Fudge’s The Fire That Consumes, in its 3rd edition now with Wipf & Stock, or his Hell: A Final Word. The former is more scholarly; the latter more popular-level. They would also benefit from purchasing his two views book with Robert Peterson, Two Views on Hell. It’s available on Kindle for cheap, I think, and your readers will get both sides of the debate. I also highly recommend your readers keep an eye out for our upcoming Wipf & Stock publication, Rethinking Hell: Readings in Evangelical Conditionalism. They can learn more about it here: http://www.rethinkinghell.com/2013/12/rethinking-hell-book-announcement. It’s in the final stages of editing and we expect it to be published this Spring. It’s not yet available for preorder by itself, but if you have any readers that are anywhere near Houston, they can preorder a copy of our book as part of their registration for our inaugural Rethinking Hell Conference this July, which they can learn more about and register for here: http://www.rethinkinghellconference.com/2014/. And, of course, we have a bunch of resources available at http://www.rethinkinghell.com. There are a ton of articles on a variety of related issues, and for your readers not yet familiar with our view, they should probably start by listening to episode 4 of our podcast (http://www.rethinkinghell.com/2012/09/episode-4-the-case-for-annihilationism-with-glenn-peoples) in which Glenn Peoples gives a positive case for our view, and then episode 7 (http://www.rethinkinghell.com/2012/10/episode-7-traditional-objections-answered-with-chris-date) in which I answer common objections from traditionalists. You’re very welcome. I enjoyed it. I actually don’t think it’s worth speculating most of the time about WHY God does things. We can use reason to prove that God exists. We can use reason to work out the various qualities of God. We can even use reason to judge the historicity of the Gospels. So once we’ve come to the reasoned conclusion “Yes, God is definitely good”, then the problem of evil, and the problem of Hell, is a non-problem. We might not know why there’s all this crap in the world, but He has the answers, and we know He’s good. Hell is a non-problem. Conditional Immortality is revolting and if anything might make a better argument for a “cruel” God then mere Hell. Damnation is the choice of the love of self above the love of Eternal Love Itself. So it seems to me a damned soul would want to hold on to themselves at all costs & here we have a “cruel” so called “god” taking away the last thing the damned has left. serious punishment. Even the damned can take some delight in mere being. I think Hell is clearly better. The Creator gives life as a privilege, not a right. Conditional Immortality is the doctrine which says that God will render this privilege eternal for those who turn from sinful rebellion against him, while for those who continue to abuse the privilege of life by being cruel, hateful, self-serving, and so on, he will remove the privilege. Which part of this is revolting? It seems like perfect justice to me. I find ceasing to exist far more horrible then mere Hell. Philosophically to exist is good and an infinite good I cannot give myself. Therefore non-existence after having existed is ultimate evil. Also practically speaking there is no real practical difference between having never existed vs existing then ceasing to exist. Since if I cease to exist there is no more me to know that I have ever existed. Which also leads to how is this any type of punishment for my crimes of rebellion against God? Hitler does not under this heterodox scheme know he was wrong nor is justice being done for him. Stalin is getting the fate he believed he would get anyway. As Taylor Cladwell once said. A Soul burning in Hell has the dignity of existence and is that much more then a corpse which rots in a grave. Not having Hell assaults my God Given dignity. I follow your reasoning, and you take a line similar to J.P. Moreland, who in aiming to show that Hell preserves the sinner’s dignity, ends up saying that it’s just, you know, “a low quality of life.” This angle sidesteps the vocabulary of rights versus privileges, which I think is more fundamental to the relevance of things like dignity and shame. It is axiomatic that God can confer a privilege upon a creature, and later revoke this privilege. That is in fact the biblical pattern, where Adam & Eve are able freely to eat of any tree, yet once they have sinned, they are prevented from eating of the tree of life, so that they don’t “live forever” (Gen 3:22). In future, the redeemed along will be granted “the right to eat from the tree of life, which is in the paradise of God.” (Rev 2:7). Who is cast outside? Dogs. There is no dignity in it. The blasphemers, the arrogant, they who “despise authority,” these are have no share in dignity and blessings of God, but are accursed, “like irrational animals, creatures of instinct, born to be caught and destroyed” (2 Peter 2:12). Nothing in scripture speaks of a dignity in Hell. I agree with you that cessation of being is an indignity. And shame, contempt, abhorrence and disgust are concepts stamped all over the fate of the wicked in scripture. Again, an axiom: God is just to destroy evil. Please also understand that the view being espoused is not limited to the notion of privation of life through cessation of being. It also allows for a component of conscious suffering as part of the process whereby a person is finally destroyed. I posted bellow because I am still trying to figure out the typology of this blog’s comments boxes. I’m afraid I have a lot of work on and haven’t been able to pick apart the whole piece, so I apologise if I raise anything that has already been addressed. First, where you speak of the unquenchable fire and the undying worm simply meaning unstoppable/irresistible as opposed to eternal. Have you simply assumed this definition or is there a specific Hebrew or Greek word that would indicate that definition? Because ‘undying’ has far more connotation towards eternal than unstoppable. It would be a strange choice of word were it not to refer to something that is everlasting. Even in the passages you reference to argue this point, such as Isaiah 66:24, there are implications that death implies something beyond simply losing one’s life. Before verse 24 the passage speaks of “New moon to new moon… Sabbath to Sabbath…” the people of God beholding the dead who rebelled against God. To me, the connotation is that the rebels have been given just punishment and are shamed for all time before the people of God. More on justice in a moment. Even were these passages not indicative of the eternal, for example when the Psalms refer to the gnashing of teeth, that in no way invalidates Christ’s use of the term for describing hell. How else is He going to describe hell other than by existing comparisons with torment on earth? It makes perfect sense that He would still use terms that the Hebrews were familiar with. You also speak of Sheol and its role in the OT. I certainly wouldn’t say the OT presents an underdeveloped theology, because Sheol is not the same as hell, it is a resting place before judgement. Revelation 20:13-15 speaks of Hades (the Greek term for the realm of the dead, i.e. Sheol) giving up its dead. It goes on to say that those gave up are then judged. What sense would judgement make to sinners if their punishment was simply to return to the state of Sheol, assuming Sheol is an unconscious ‘sleep’? But for me, it is the implications of annihilation that are the main argument against it. There are issues it brings up that I cannot resolve with the Christian God. 1) God is a just God, and sin against Him in His complete infinity is paramount to an infinite crime. The only just punishment is an infinite one (eternal damnation) and the only salvation is an infinite saviour (God in Jesus Christ). To simply stop existing is not justice. It means that Stalin, Hitler, Mao, all these who committed atrocities – they got away with it. They don’t care that they fell short of God if they aren’t here to know it. That’s not justice. That’s not a just God. 2) A comment on the blog raised a very good point, though I did not agree with the conclusion. But their point was, those who are not saved are instead given over to what they chose to give themselves to. That is their hell, because for eternity they will be chained to something that will never satisfy them. With eternal damnation, God leaves the sinner with the sin they clung to. With annihilation God takes away even that and removes their choice. 3) Lastly, annihilation takes away the fear of God. 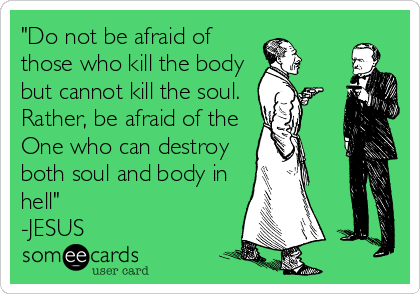 The blog piece has a cartoon of that famous quote, “Do not be afraid of man who can only kill the body…” If annihilation is true, then why would a non-believer need to fear God any more than man? Sure, if he trusts God in Christ, he will gain everything, but if he does not… he will never feel the sting of what he lost out on. He will merely die and it will no longer matter. So yeah, apologies again if I missed anything and made any obvious blunders by missing anything in the interview. I hope at least some of my points provide something interesting to think over. Regarding the “undying worm,” actually there are several times in Scripture in which something is promised that it “will not die,” and yet we know that everlasting isn’t what was meant. Check out http://www.rethinkinghell.com/2012/07/their-worm-does-not-die-annihilation-and-mark-948. And for fire, http://www.rethinkinghell.com/2012/11/the-fire-is-not-quenched-annihilation-and-mark-948-part-2. In short, no, I’m not assuming what unquenchable and undying mean; I’m using Scripture itself. And Isaiah 66:24 *explicitly* identifies their host as corpses, not living people. As for returning to death being a punishment, it makes sense in a dualist anthropology in which, in the first death, the immaterial souls of folks are still alive; in the second death, as Jesus states, the soul will die as well (Matt 10:28). In a physicalist or monist anthropology, it makes sense as well, as my friend Joey explains here: http://www.rethinkinghell.com/2012/07/double-jeopardy-why-raise-the-dead-only-to-destroy-them. Regarding your three objections, (1) there is no biblical basis, whatsoever, for the claim that any sin against him warrants infinite punishment. But even if you’re persuaded that that’s the case, as I demonstrated in the interview, annihilation is an eternal punishment, and in that sense it is infinite. So this objection doesn’t hold up. And as for the notion that Stalin, Hitler, Mao and others just “get away with it” in conditionalism is just, well, nonsensical. The punishment of death is the punishment reserved for the most heinous of crimes. (2) If it is somehow wrong or unjust of God to kill the lost because it takes away their choice, we might as well chuck out the entire Bible since God frequently kills or commands the killing of people, a la the flood, Sodom and Gomorrah, etc. (3) Human beings are terrified of death. The Bible explicitly says so (Heb 2:15). Atheist Philip Larkin was terrified of death (http://www.youtube.com/watch?v=IDr_SRhJs80). Before I was a believer, I was terrified of death, even though I thought it would be the end of my conscious existence. The claim that annihilation takes away the fear of God simply flies in the face of all evidence. For more: http://www.rethinkinghell.com/2012/07/wind-out-of-the-sails-a-response-to-greg-koukl. I appreciate your comments, Ian, but frankly my commitment is to the authority and reliability of the Bible, and so I have to believe what it says awaits the risen lost, which is annihilation, the permanent end to life and conscious existence. I’d be happy to talk further over email if you’d like to email me at chrisdate@rethinkinghell.com. I find it suspicious that YOU have figured all of this out, but apparently the 2000 year old Church, and most of its various offshoot denominations, which has (at least almost) consistently believed Hell to be eternal, disagrees with you. But you have proven that they’ve been wrong this whole time. This in itself isn’t a counterargument by any stretch, but it raises a red flag to me. Also, your commitment is off base. Whose commitment is to the authority of the Bible? Shouldn’t it at least be to Jesus, even if you don’t want to make the step that the Catholic Church is the one He founded (I’m not saying, at this moment, that you have to)? Shouldn’t your authority be to Jesus first, and then if you believe what He says try and figure out if the Bible has any sort of weight to it after that? I know my reply sounds harsh, and sorry about that. I respect you, your work, and the effort you put into it, I’m just not sugarcoating my responses. Please don’t take this to mean that I’m trying to minimize anything you say. In fact, I think that’s one thing Lothar has right – were I a Protestant, I would not believe in the inerrancy of Scripture or an authoritative, official canon. Why would I? Your 2000 years of history claim is a rather ignorant one. (I say ignorant in the technical sense of not knowing, not in any sort of inflammatory sense.) There are very good reason to believe that the earliest Fathers were, in fact, conditionalists/annihilationists: http://www.youtube.com/watch?v=je3AW6QeXzk. The traditional view became dominant around the 3rd century, and yes, reigned supreme for quite some time, but it didn’t start out that way. Neither is conditionalism a 21st, or even 20th century novelty. Conditionalists are found among Christians of the 19th, 18th, perhaps even 17th centuries. Therefore, it’s not 2000 years of Church history with which I have to contend; it’s about 1500 years, prior to which my view was dominant. Certainly I am committed to the authority of Jesus Christ as God incarnate. However, it’s the Bible that contains his words and deeds. As one who is committed to the authority and reliability both of the Bible and of the words of Jesus which it contains, I am forced to reject the traditional view in favor of annihilationism. Not in a place to watch that youtube video, but I assure you I will. Also, 1500 years is a Hell (haha) of a long time, and even for the first 500 years there’s good evidence to suggest that “prominent” is charitably a stretch. It is a long stretch, but one which began after a couple of hundred years in which my view dominated. If my view were a modern novelty, I might find your argument more compelling. But in light of the fact that annihilationism dominated before the traditional view of hell did, I’m not really moved by your argument. Okay, congrats to Irenaeus. You can possibly make the case he was a conditionalist, though that was by no means clear (that whole long article fails to take into account when Irenaeus actually said that the punishments of the damned were not temporal, but eternal, and when he uses the phrase “damned forever”). You claim that annihilationism was the prevailing view for “a couple hundred years” (down from five hundred, by the by). Prevailing, though? Clement of Alexandria was a traditionalist. Hippolytus of Rome, quite possibly a student of Irenaeus, was a traditionalist. Ignatius of Antioch, Clement of Rome, quite possibly Paul’s associate Barnabas, Theophilus of Antioch…all of these men, with the exception of Hippolytus, made their teachings clear before 200 AD. All were traditionalists. Will watch the video very shortly, I was out all day. 3) Lastly, annihilation takes away the fear of God. The blog piece has a cartoon of that famous quote, “Do not be afraid of man who can only kill the body…” If annihilation is true, then why would a non-believer need to fear God any more than man? Annihilationism cannot take any fear away for someone who doesn´t believe in your god – there cannot be less fear than no fear at all. I was raised a Fundamentalist, and hell was talked about quite often. I converted to Catholicism about 10 years ago, and of course the Church preaches that hell is a real place of everlasting torment. Here has been my problem for the past 31 years of being a mom. Totally subjective, I know. There is NOTHING that my children could ever do to me that would cause me to turn my back on them. Nothing. I would never wish for them any type of everlasting harm or pain. Since God loves us more profoundly than I could ever love my own children, I just can’t accept that he would throw anyone into everlasting torment. Of course, my children could choose to never have contact with me again. That is free will. So I can understand why God would remove immortality if someone made an irrevocable decision to not want to be with God at all. But everlasting inflicting of pain? Not so much. I ran across the blog “Jesus Without Baggage” and this is the first time I heard of the doctrine of conditional immortality. This Q&A has been very helpful, because it goes into greater detail on the exegesis of the passages on hell, the grave, the soul, etc.. My only question was touched on in this blog post. If the lost die, where are their souls during the time between death and final judgment? And then we have the issue with those who have never heard about God at all. But that’s for another time. Hi, Sheila. I’m blessed that you found Lothar’s questions and my answers helpful. One minor correction to your comment, though: you said you “can understand why God would remove immortality…” That’s not quite right. We don’t have immortality to begin with. It’s not that God will remove immortality, it’s that he will not give it to the lost. Feel free to email me at chrisdate@rethinkinghell.com if you have any further questions. Thanks for clarifying. So, we are born mortal, but are gifted with immortality by God when we follow him, do I have that right? I’ve always been a dualist. You don’t believe in an eternal soul, do I have that right? If you disagree with one of the dogmatic, doctrinal, must-believed teachings of the Church, why are you Catholic? This is not supposed to be something up for debate. This is a settled question. You became a Catholic despite knowing, I’m sure, that Catholics taught as doctrine the eternal torment of Hell. Why did you, if that was such a big sticking point? Wouldn’t this be something that might keep you from making the swim over the Tiber? Okay, so now I see your clarification. Yea, your first reply was a bit harsh. At the time of my conversion, it was not a big sticking point. I have only come to believe in conditional immortality within the past six months or so. I’ve been Catholic for nearly 10 years, and I’m certainly not going to leave the Church because I’ve changed my views on hell. In the Creed we proclaim that Christ will come again in glory to judge the living and the dead. The Creed doesn’t spell out what comes next. It is the Church’s understanding that there is a literal and eternal place of conscious torment, called hell, after the judgment. That understanding could change, just as the doctrine of Limbo did. Anyway, I don’t accept the premise of your question. I don’t see a rigidity in the Catholic Church. Indeed, I have never felt more liberated. I have a peace that comes from the simplicity of following Jesus’s example and his lesson of love. Love God, love your neighbor. Those are the two commands upon which any dogma, doctrine, or rule rests. Simplicity and freedom. You ask me a question and then say it isn’t up for debate that “this” is a settled question. What is the “this” to which you are referring? I can’t answer your question (which implies a certain mindset in place) until and unless I understand exactly answer you are attempting to elicit. But eternal Hell is official Church teaching. It cannot change, any more than the Church could, say, one day declare that Mary wasn’t ever-Virgin, or get rid of one of Paul’s Epistles. Check out the New Advent article on Hell (it’s actually pretty fascinating). Just Google it, it should be the first thing that comes up. Limbo was NEVER a dogmatic teaching, and even now, by the way, contrary to a lot of people’s beliefs, people are most certainly ALLOWED to believe in Limbo. Your whole point about not seeing the rigidity in the Church is a little odd. Forget all of that. The Church has official teachings, some of which can’t be changed, period. Hell is one of those things. Whether or not it feels “rigid” doesn’t really matter here. Well, as I said, when I entered the Church I believed in hell. As to dogma vs doctrine vs discipline, those are complex. Yes, the Church has always taught a literal hell. She still does. I honestly don’t know if that is dogma, which will not change, or doctrine, which develops over time, as the Church is guided through the centuries by the Spirit of God. If you are correct about a literal hell being dogma, I still can’t go back to what I once believed. I had my own issues with it in the first place, and I have read what those folks who do not believe in hell have to say about the Bible passages on judgment and punishment. They put into words what I had been thinking about, and they have proven from the Bible why they believe what they do. I’m satisfied with their reasoning. I will never leave the Church over the issue of hell. Hell isn’t a part of my everyday life. I am a faithful, practicing Catholic, who goes to Mass regularly and also avails myself of the Sacrament of Reconciliation. It’s my duty to love God and love my neighbor. If I keep those two straight, then I will hopefully be on my way to eventual salvation. Wow, I just got to the section on Ignatius of Antioch in that video. That is one heck of a stretch to make it seem as if the quoted paragraph somehow supports conditionalism. It has always been the traditional understanding that the “wages of sin is death”, and as was even admitted at the beginning of the video eternal torture in Hell is often referred to, by traditionalists, as the equivalent of not being within Life, understanding Life as Christ. Even then, just read the text.”Let [the prince of this world] not lead you away captive from the life which is set before you.” Not from all existence. If that’s where this is heading, I’m not going to be impressed. >Nothing in scripture speaks of a dignity in Hell. This assumes the Protestant heresy of Sola Scriptura(i.e. all doctrine must come from the Bible alone) which itself is not found anywhere in scripture thus false by it’s own standards. As a Catholic I reject this presupposition. I reached my original conclusion via natural philosophy and deduction. I would partially agree that in principle God if He wanted too could have created beings which are conditionally immortal by nature then allow some of them to expire from existence for some reason which would not be un-natural for them. But this begs the question. Did God really create us this way? Because if He didn’t & in fact created us unconditionally immortal then to cause our extinction would be a gross violation and act of violence against our nature. Also God would be contradicting His own immutable will which is inconceivable. I agree with Catholic lay theologian Frank Sheen. Since the damned have chosen disordered self love above all things He doubts they would choose non-being if given the hypothetical choice since they would know it was against their nature and they would loose their selves which they would likely hold on too at all costs. I don’t think my statement “Nothing in scripture speaks of a dignity in Hell” really assumes Sola Scriptura. Rather, on my specific point about whether life is a creational right or a revocable privilege, it assumes the adequacy of the Bible as special revelation. But I don’t merely assume it, because I have a made a comprehensive study of what the Bible says about life, immortality, and the concept of actually living forever, and I conclude that it speaks adequately to this issue in a way which constrains insights from natural theology/philosophy. “Will what is made say to its maker, ‘Why have you created me so?’ Or does not the potter have *a right* over the clay, to make out of the same lump one vessel for a noble purpose and another for an ignoble one… vessels of wrath made for destruction?” (Romans 9:20-22, NAB). I’m not sure I see much daylight between the concept of an “ignoble purpose,” and that which would allow for the “indignity” you cite. Since God never came into being and we did, and since we “live and move and have our being” contingently “in him” (Acts 17:28), nothing about this ontological relation cannot, by rights, be severed. God can take away the life he gives, because he has not given immortality or independent / self-subsitent being. However, “To those who by persistence in doing good seek glory, honor and *immortality,* he will give eternal life.” (Romans 2:7). Indeed, as I noted before, to those who are victorious in this pursuit Jesus Christ “will give the *right* to eat from the tree of life, which is in the paradise of God,” (Revelation 2:7)—which is the means by which mankind can “live forever” (Genesis 3:22). This is because Jesus is he “who has destroyed death and has brought *life* and *immortality* to light through the gospel.” (1 Timothy 1:10). I love classical philosophy and theology as much as the next guy. But I don’t think the Hebrews were that sophisticated, so I constrain my biblical hermeneutic to more straightforward interpretations of the terms and conceptual phrases involved in the lexicon of final punishment. From Genesis to Revelation, there really is no room for inversion of terms, away from the ontological implications of a plain reading. To say that persons in a traditional Hell merely “exist” rather than are alive, is an example of such sophistry. Jesus spoke plainly of a bodily resurrection (coming out of the tombs), where some will go to life, while others to judgment. (John 5:29). The latter group are not therefore disembodied, immortal and indestructible souls, as Plato would have it. Rather, they are mortal, because they have not been granted life. The age-to-come is upon them, and they have nowhere to go, for they are NOT “accounted worthy to attain to that age and to the resurrection from the dead.” (Mark 20:35) They have been resurrected, but they are judged unworthy of continuing on. They are, tragically, to be destroyed, body and soul, in Gehenna (Matthew 10:28). Okay, these passages are quite compelling. I’m digging into dogma and doctrine at New Advent, and the Church’s teachings on eternal punishment in hell are considered dogma. I have to do some more research. This takes me back 15 years to when, as a good evangelical, I was deeply troubled by the standard view of hell and was exploring any possible ‘biblical’ alternative. I read Wenham and became interested in conditional immortality, but unconvinced. It felt like a convenient and neat alternative that would allow me to remain evangelical while rejecting eternal conscious torment, but I never found it fully satisfying, intellectually or emotionally. Though if I had to remain evangelical, it would probably be the option I’d choose. In the end though, I became less and less convinced of biblical inerrancy and other evangelical tenets, and so more drawn to interpretations of hell from outside the evangelical tradition – for example, Orthodox ideas and also more ‘liberal’ or psychological views. My current view on hell is that it, if it has any reality at all, it is the inner condition of a soul who persists in shutting out the light, life and love of Christ. It is a state of unreality and un-relationship, but self-chosen and self-maintained – and always with the hope of redemption. I applaud the efforts of evangelicals to find more merciful and humane readings of biblical texts on hell. However, to my mind the endeavour is flawed because the whole evangelical paradigm is flawed, based in my view on a mistaken understanding of what the Bible is and how it should be read. The Bible should be read first and foremost according to scholarly standards of interpretation, aimed at getting to the intended meaning at the level of the text. What one does with it from there I think is a separate question. Conditional Immortality is just what the text indicates at the ground level. I don’t see it as especially evangelical or anything else. If one wants to additionally find mitigating texts which are more merciful and hopeful, one can do that. Universalism does that to the traditional view with relative ease, since the traditional view posits the eternal existence of souls. It is much harder to do with Conditionalism, however, because the finally punished no longer exist. One could still come back around with the concept of resurrection, I suppose, but there are good reasons not to do that, particularly the emphatic imagery of relentless scavengers and unquenchable, consuming fire. Thanks Peter. I see you’ve made a careful study of the Bible in relation to this topic. I too spent a lot of time on this at one point in my life, seeking out all the texts on hell, judgement, the afterlife etc in order to find an alternative to the classic evangelical ‘Eternal Conscious Torment’ view. You seem very certain that ‘Conditional Immortality is just what the text indicates at the ground level’, and I appreciate that you can back this up with a goodly list of biblical texts and logical arguments. I don’t fully share your confidence; it seems to me that conditional immortality certainly has good credentials as one of the viewpoints that can be found in Scripture, but I’m not convinced that it’s the only one, or that it’s necessarily what all the relevant verses clearly indicate. More than that though, I no longer see the Bible as a homogeneous entity presenting a single, clear view on this or any other question we wish to ask of it. I think it contains different strands of thought from different people and times, and that we do violence to it by attempting to make it speak with a single voice. But on this and all other things, I’m happy to acknowledge that I may be wrong! I love classical philosophy and theology as much as the next guy. But I don’t think the Hebrews were that sophisticated, so I constrain my biblical hermeneutic to more straightforward interpretations of the terms and conceptual phrases involved in the lexicon of final punishment. From Genesis to Revelation, there really is no room for inversion of terms, away from the ontological implications of a plain reading. And the smoke of their torment goes up for ever and ever; and they have no rest, day or night, these worshipers of the beast and its image, and whoever receives the mark of its name. …Are NOT to be read in a straightforward way. We are supposed to go through all manner of textual juggling to try and avoid the most obvious and straightforward reading of these verses. But the verses that seem to support what you say? Well, then there is no room for an inversion of terms. I think this was a very interesting read. I think your idea of unquenchable fire sounds reasonable. I give the link not so much because I think the link is right (I am Catholic but I am not really sure on this issue) but because it does give several opinions of how early Christians thought. They are not first century readers but they are some of the earliest ideas we have of how Christians thought. Its unclear why they would depart from what the first century Christians would have taught. “We have been taught that only they may aim at immortality who have lived a holy and virtuous life near to God. We believe that they who live wickedly and do not repent will be punished in everlasting fire” (ibid., 21). Well if we are punished in hell eternally then we would in fact be “immortal” right? But immortality is only for they “who have lived a holy and virtuous life near to God.” So this passage seems to lend credence to your interpretation that everlasting fire is one that completely destroys as opposed one that keeps burning us. I think we will find other passages in scripture where everlasting life and immortality only come to those who are good Christians. I think this is likely the most fertile ground for your case. An everlasting life of pain and suffering is after all an everlasting life. But everlasting life seems only for those who make it to heaven. Hello, thanks for your comment. Though I agree with them, the sentences were written by Evangelical writer Chris Date whom you may contact or directly respond to here. I think we have no Biblical grounds for eternal hell, at least as far as the Protestant Canon is concerned. That said I reject the teaching of Biblical inerrancy. But annihilationism, as you yourself admit, did not “dominate”. It was at best up for debate, believed by some Church Fathers and not by others. 500 or so years later the question was settled and we have had near universal agreement on the eternity of Hell for around 1500 years. Couple with that with some questionable textual stretches and interpretations, and I’m not really moved by this whole line of thinking. Not sure why, but reply buttons don’t appear under some posts, making it increasingly hard to interact. I will reply to “malcolmthecynic” here instead. Let me see if I understand. According to you, my following proposals mean that I’m playing “a dangerous game” and have “a tricky position… to defend,” because my agenda is just to prove my pre-existing view, which is easily exposed by a couple of proof-texts. OK, so I think it’s clear why #1 and #3 are practically axiomatic. And clearly you misunderstood me on #2. I never argued for a wooden-literal hermeneutic across the board. Considering things like idiom and genre is just a given. Very elementary stuff here. So when you throw down your two texts, I wonder why you don’t seem to think that matters. You introduce your own principle now, that an entire verse should be read in “the most obvious and straightforward reading,” which would force me to tap-dance “through all manner of textual juggling to try and avoid” that reading. C’mon man, seriously? Which “straightforward reading”? Whose “obvious”? Surely not yours or mine, so far removed in time, place, language and culture. What about the first readers and hearers, so far as we can ascertain it? Wouldn’t that seem best? Let’s look at Mark 9:47-48 first. What do you think Jesus meant to invoke by referring to Gehenna in the context of final punishment? Could it be the prophetic references to Gehenna and its role in final punishment, found in the Jewish scriptures? And what do you think was “obvious” to his hearers when he quoted Isaiah verbatim in this context? Could it be Isaiah’s prophecy about final punishment? Shouldn’t we therefore use the Jewish scriptures as the lens by which we learn what is an obvious and straightforward interpretation? And if we find one, why let Plato toss it down into a cave? So what does the O.T. teach about Gehenna in connection with the fate of the wicked? In short, that it would receive a name-change and become “The Valley of Slaughter,” where the corpses of the slaughtered wicked would be tossed and burned. The devastating slaughter is the principle punishment (for what it entails about being cut off forever from life, i.e. everlasting life), and the icing on the cake is the putrid, undignified consumption of their corpses by fire which God himself kindles. No honorable burial; no hope of future resurrection. Just a terrible end, cast headlong into Topheth writ large (Topheth itself meaning “place of burning”). Just look at the relevant prophetic texts and there will be no doubt that everybody knew what “Gehenna” would become. But Jesus didn’t only invoke that motif. He invoked Isaiah’s prophecy about exactly the same event. Gehenna would be piled high with “the dead bodies of this people [as] food for the birds of the air, and for the beasts of the earth, and none will frighten them away.” (Jeremiah 7:30-34). These bodies of the wicked shall “not be gathered or buried. They shall be as dung on the surface of the ground” when all the bones of the patriarchs are finally brought out of their tombs, suggesting resurrection (Jeremiah 8:1,2). In future it shall be a byword and “the ears of everyone who hears of it will tingle” when the Lord “will bring disaster upon this place” since it has become a place of innocent blood of children burned to false gods (2 Kings 23:10; 2 Chron 28:3, 33:6)—no longer Gehenna but the “Valley of Slaughter” (Jer 19:2-6). Though it exists outside Jerusalem’s walls to the south at the base of Mount Zion, this is no local devastation, for Jeremiah says again, “And those pierced by the Lord on that day shall extend from one end of the earth to the other. They shall not be lamented, or gathered, or buried; they shall be dung on the surface of the ground.” (Jer 25:33). This passage combines two other elements of the wider motif, which is the Lord coming in a tempest of wrath, and the nations being forced to drink the cup of wrath which makes them drunk, stumble and fall (never to rise again), with the whole scene resembling the roar of those trampling grapes in the city’s winepress. Revelation 14:18-20 makes the sword a reaper’s sickle, and the winepress flowing with blood. It is Jesus who will “tread the winepress of the fury of the wrath of God the Almighty,” who brandishes “a sharp sword with which to strike down the nations” and whose robe is dipped in blood (Rev 19:13-15). Following this, as in the wider motif, the scavenging birds come, to “eat the flesh” of all the slain. The beast and false prophet who lead the armies are thrown into the fire (Gehenna, I would say), however “the rest were slain by the sword” of Jesus, “and all the birds were gorged with their flesh.” (v21). Earlier Isaiah had said that the earth’s people have transgressed God’s laws, and “therefore the inhabitants of the earth are scorched, and few men are left.” (Isaiah 24:5,6). He later concludes his work prophesying the great and terrible day of the Lord, when “The Lord will come in fire and his chariots like the whirlwind, to render his anger in fury, and his rebuke with flames of fire. For by fire will the Lord enter into judgment, and by his sword, with all flesh; and those slain by the Lord shall be many”—but those who survive will remain forever, worshiping God, just as the “new heavens and the new earth” will remain. When the righteous of the world gather to make an offering to the Lord, “they shall go out and look on the dead bodies of the men who have rebelled against me. For their worm shall not die, their fire shall not be quenched, and they shall be an abhorrence to all flesh.” (Isaiah 66). There’s no need to speculate, as Jesus tells us that this is the fire of Gehenna, and that sets the passage in its proper context. This is the place where dead bodies having been slain by the sword are thrown, denied an honorable burial or lamentation, scattered like dung, their blood poured out on the ground, utterly abhorred by the righteous, consumed by fire, maggots, birds, and other scavenging beasts—which shall not be “frightened away,” or quenched. This is the motif of the Gehenna of fire, of “Topheth” writ large, “long been prepared” as a funeral pyre “with plenty of wood; The breath of the Lord, like a torrent of brimstone, sets if ablaze.” (Isaiah 30:33) The Valley of Slaughter is made full on “the day of great slaughter,” when the Lord descends in burning wrath and dense smoke, “His tongue… like a consuming fire; His breath… like an overflowing torrent which reaches to the neck, To shake the nations back and forth in a sieve… His arm descending in fierce wrath, in the flame of a consuming fire.” (v25,27,28,30). Nowhere in the Gehenna motif is there a sense that the dead are really alive. When Jesus referred to it, there is no reason to think that the ears of his hearers weren’t already “tingling” (Jer 19:3) with what they knew about it from the prophetic literature. It will become the valley of slaughter. And Isaiah speaks of the day of slaughter. So when you are aware of that, you don’t miss all the slaughter in Revelation either. Fire and Sword are just that closely associated. Dead bodies abound. Scavengers come to relentlessly consume these remains. How horrid. All of the imagery on final punishment points toward an everlasting death, not an eternal life of torment. I didn’t say your proposal was easily exposed or assume you had nothing left to say in the discussion (I doubt you’d be where you are if that were the case…it would frankly be a bit disappointing! ), I merely thought that the claims you were making, sitting out there on their own, had problems, which I tried to show. I’ll take a look at the rest later, thanks for responding. I totally forgot about this thread until Marc linked to it again, and I don’t like leaving things hanging. I promised a response, so here it is, several months late…sorry. Okay, let ME see if YOU understand me. 1) I did not say your position was “easily exposed by a couple of proof-texts”. Don’t read things in that aren’t there. 2) I think you have a tricky position to defend because you have a tricky position to defend. 3) In the original article you actually say that it’s “really hard” for you to put yourself in the shoes of a traditionalist, despite supposedly having such a view “not long ago”. Sorry. I think you’re wrong. If it’s as obvious as you seem to think, then you must have a conveniently low opinion of others. I think it’s “obvious” because throughout the vast majority of Christian history most people have. Hate to break it to you, but you’re defending the minority view here. Do you know what it means to be a Catholic? All right, here we reach a good point of discussion. Your points about Gehenna are granted. They’re all good. But as C.S. Lewis says, Hell is generally conceived in the Bible in three ways: Punishment, banishment, and destruction. You’ve found evidence of the destruction part, which I’ll grant you easily. At this point, I point them to places in the book of Hebrews in which the author speaks of the “eternal salvation” and “eternal redemption” purchased for us by Jesus Christ. Jesus is not and will not be forever undergoing the process of saving and redeeming; he accomplished that once and for all by his life, death, and resurrection. When does the text ever indicate, even metaphorically, that Jesus is forever undergoing the process of saving and redeeming? Paul actually rejects this specifically in verses 26 through 28. The eternal salvation and eternal redemption are nouns in this context that refer to us, not Jesus. So in one sense, as Lewis points out, annihilationism is correct, but it is not complete. Fire turns things into ash and smoke. A soul that is destroyed does not disappear; the soul is meant for eternity. But all that makes it a man in the sense that we, and Christ, use the word is destroyed. Destruction of a soul must have consequences, and what emerges from the eternal fire is the portion of the soul that wants to be in Hell. It is, in fact, an interesting response to the common objection of the damned begging to be let back into Heaven. By removing the “human” part of the soul God is in fact making Hell bearable for the damned while at the same time exacting justice. And we speak of “eternity” in the sense of time as we understand it. I think this is wrong-headed. Once we leave time in one sense everything is eternal. If “Hell” is outside of time then those souls simply exist; one cannot be annihilated for eternity AND exist for eternity. And how can we conceive of punishment for the damned if the damned are immediately annihilated? You seemed to be offended by my use of proof-texts, which I guess is fair. I shouldn’t have wielded them like weapons. My point, though, was this: You claimed that the early Church Fathers would have agreed with your view, but when I did my own research on the Church Fathers’ views some seemed ambiguous, some would have agreed with you, and some would have believed that Hell was eternal. All right, that proves nothing. But then the Church councils rolled around, and THEY decided that Hell was eternal. So what it looks like to me is that we have a very common pattern going on: It starts off with debate and ambiguity, then a council is called to settle the matter and the council’s position is being binding. After the councils the consistent teaching of the Church for over 1,000 years was that Hell is eternal. So, I am not a Greek scholar. Necessarily my arguments will always be, to some extent, arguments from authority. So, who will I believe here? The consistent teaching of the Church, or modern theologians who supposedly re-discovered the teaching of the Church from the first few centuries of its history, which at any rate seems far from clear to me. Should I trust the authority of the Church councils, or of modern scholars? Given that, can you understand why I have a high level of skepticism here. I see that you thought I was being too dismissive. For that, I really do apologize – that was not my intent. And if you note that my approach has changed, you are correct, because I’ve done some more reading on the subject. I do, ultimately, disagree with you though.